From the start of the war, periods of leave are a subject of significant concern for the Germans both within companies and amongst officers, but reports on the morale of the battalions only began much later, starting at the end of 1917. Only very rarely is the atmosphere particularly rosy for the occupiers. Indeed, spending 4 years far from loved ones, in a foreign country and occupying an enemy country, is anything but a joy on a day-to-day basis. Desertions and escaping to the Netherlands are regular occurrences, and some Germans go so far as to deliberately end their days. While the hope of a quick end to the war is a source of joy at the start of the conflict, they are soon left only with a few days of vacation, distributed episodically and quite unevenly, during which to visit their families. Outside of vacations, the men have little in the way of relations with Germany and their families. The mail system is a widely used means of communication, firstly to hear the news but also because most of the men send their pay home to their families, at least until food prices explode in Belgium. It is not unusual for this money not to reach its destination, which prompts the government to announce that any monies that do not reach their intended recipients will not be reimbursed. Excessive detail is prohibited when describing what's happening at the front, or even in Belgium. 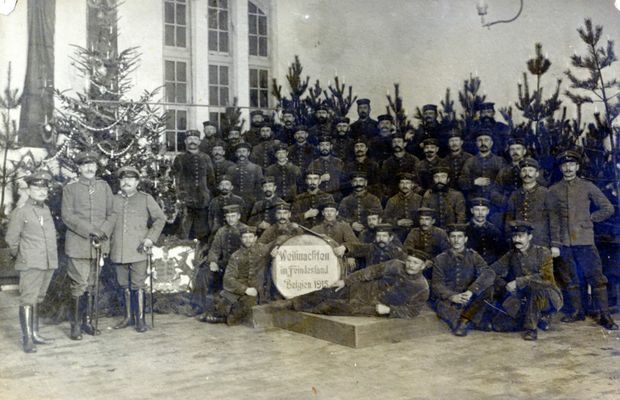 In mid-December's 1915, the authorities inform soldiers that the German postal system is already overburdened, and that there is no point sending Christmas cards to their families, which are asked to wait. From time to time, the men receive food parcels from their families but also from the German Red Cross, notably during the Christmas holidays. Another link, though very indirect, between the occupation forces and their families will be the wartime fundraising efforts. In all, 8 general collections are carried out amongst the battalions, in order to help families in mourning. The collected sums vary enormously: indeed, while the fifth collection in November 1916 successfully gathered 147,770 marks, the seventh one a year later only brought in 45,900 marks. The total climbs back up to 108,300 marks for the eighth collection, after an "advertising" campaign by the officers and company commanders amongst the men. Other battalion-specific collections are held throughout the war, for a specific family or for all of the families of the men killed in combat. Between 400 and 600 marks are collected per family, between 1400 and 2500 for all families taken together, per battalion and per collection. To correctly understand the evolution of morale amongst the troops, it is necessary to specifically study the policy for granting leave. Before considering numbers, it is worth recalling that the vast majority of German Landsturm battalions (occupation troops) include more than 500 men involved in farming, which represents a proportion of more than half, and that these men are aware of the agricultural production difficulties being experienced in Germany. Until 1916, in fact, the vacation policy is quite generous: in the sowing and harvesting months, there can be up to 250 men on holidays during one month, including 180 farmers, distributed according to what the farms produce. Some go during the spring and summer, others prefer to take their leave in the autumn when the time comes to harvest grapes and potatoes. In 1917, two sets of orders are issued in order to limit vacations. The first, in March, limits the number of men on leave at a given time to eight men per company, while the second, in June, sets a limit of 10% of the entire battalion. Both of these policies are quickly abandoned, perhaps under pressure from farmers. The third, that causes the biggest stir, is issued on 20 October 1917. As of this date, only 3% of the men can simultaneously visit their families while on leave. This order, that even some officers consider to be severe, henceforth allows no more than 40 men per month to return to Germany. Only a death in the immediate family or a case of force majeure makes it possible to avoid these rules. This rule is only slackened starting in June 1918, from which point we see an average of 100 or so men on leave per month, which remains the case until the end of the war. While morale wasn't really a particular problem until October 1917, this limitation of holidays, together with a drastic decrease of supplies, the long duration of the war and the restriction of the postal service, provided the straw that broke the camel's back. The atmosphere within the battalion remains good, but the men are starting to complain more and more, unable to understand the limitation on leave. With the arrival of 1918 and the cease-fire agreement with Russia, morale climbs but the discontent with regard to leave periods remains palpable, and not only amongst farmers. Realising that the little available vacation time is reserved for farmers and without themselves having had any leave since May, labourers do not see any improvement of the situation with the arrival of the spring. Indeed, this season increases the already considerable pressure on farmers, who are forced to remain within their battalions at the time of the spring sowing. They therefore see their annual harvest slipping away. Inversely, confidence in the military situation is total, even though the battalion remains divided regarding the political situation. The atmosphere improves in June 1918 when leave once again becomes more frequent, but this increase again favours farmers, which for the first time creates a certain degree of animosity within the battalions, between the overlooked labourers and the privileged farmers. Until August, the men remain confident in Germany's ability to win through force. It is only in September that this certainty declines and that a hint of sadness can be perceived in the hearts of the men, according to the reports written by officers. However, this feeling does not truly mar the atmosphere and the morale of the men, who remain serene until the final days. When first heading off to war in August 1914, no German Landsturm soldier imagines that he had just kissed his wife for perhaps the last time for 4 years. Never intended for the front, with their mission being to occupy Belgium, and despite how the conflict gets bogged down, they should have access to leave on a regular basis, given their seniority and their importance for the harvests. However, as time passes, the policy changes within their hierarchy, and each time, the lucky few have to wait longer and longer before seeing their families. The circle becomes vicious: there is a need for farmers in Germany in order to counter famine, but this creates an imbalance relative to the other soldiers who must remain in Belgium, with their morale falling visibly. But when all leave is prohibited, the famine becomes even more pressing. Germany's defeat is due to a great number of different factors, but the absence of these men from their farms for more than 4 years is doubtlessly a factor that is much more important than previously thought. Even at the time, they were quite aware that they would have been much more useful for their country at home in their own fields, rather than watching kilometres of railways in Belgium.